No churches allowed on atheist road ? They have struck again. First attacking John DePetro, now taking over roads. There is no such thing as an "atheist road." 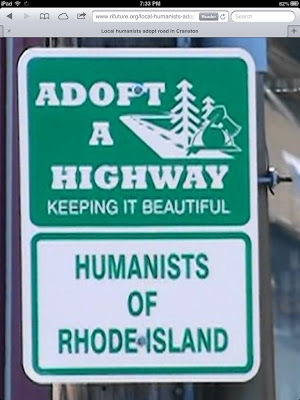 The Humanists of Rhode Island have been cleaning this particular stretch of highway for a year and a half now. You're a bit late to the party. As a Humanistic Jewish woman, and member of the Humanists of Rhode Island, I find your *sarcastic* comments offensive. 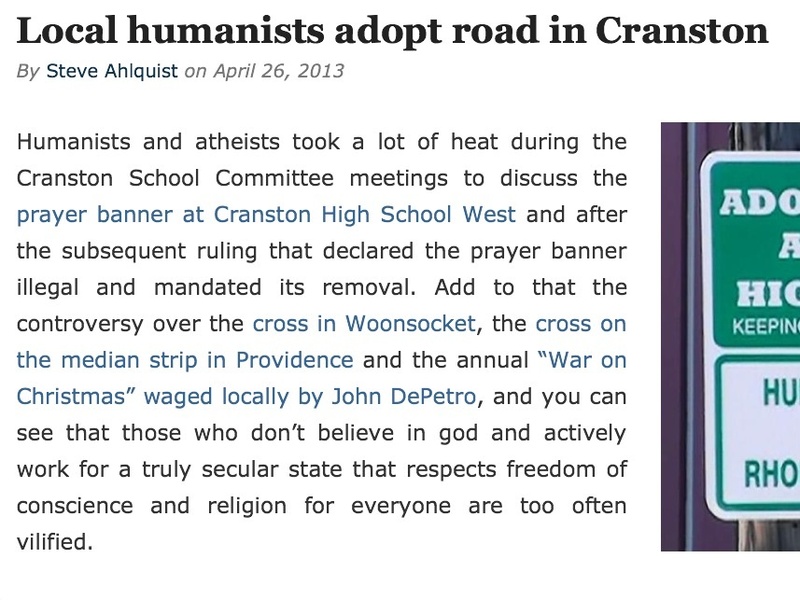 First of all, the Federal Courts found that the City of Cranston & the Cranston School Committee were in fact in violation of the law by permitting a Christian School Prayer to be displayed in the school auditorium - NOT the Humanists of RI. Did you know that the principal of Bain Middle School promptly removed a similar school prayer that hung on their school wall as soon as the ACLU notified them that they were in violation? 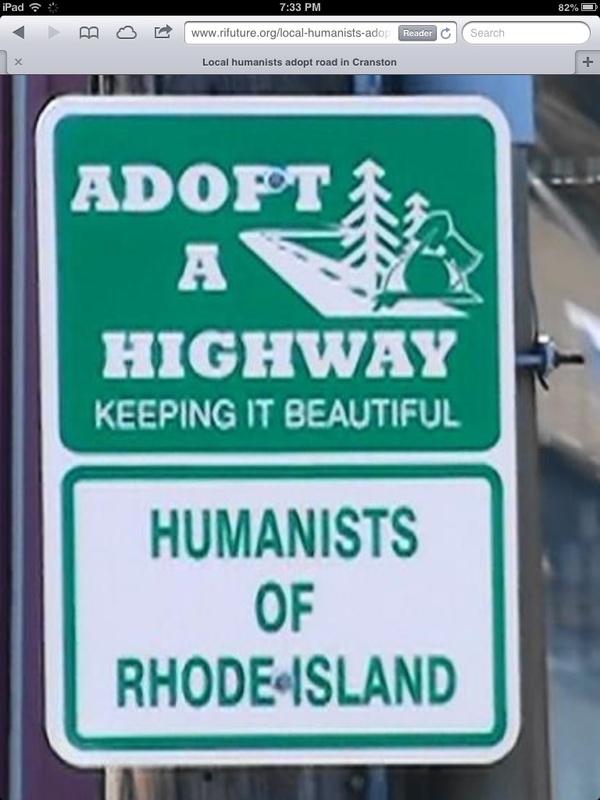 Secondly, the Humanists of RI are not at all saying that Churches, or other places of worship are not allowed on any roadway. 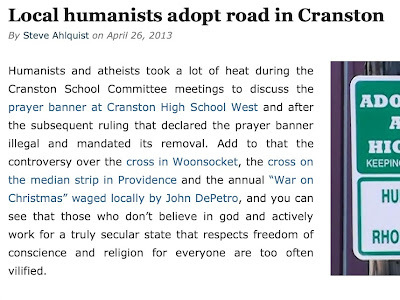 Furthermore, I don't recall when or where the Humanists of RI ever "attacked" you John DePetro. And finally, the Humanists of RI collected over 1 dozen trash bags along the stretch of highway that we "adopted". If you are interested in doing community service, please join us at our next Adopt-A-Highway clean-up scheduled for June.